The Heliocol system demonstrated how an environmentally friendly technology saves money and provides extremely accurate temperatures. Using your existing pool pump, pool water is directed through a series of valves to your solar collectors. Pool water enters the solar collectors at the bottom and rises to the top through the individual tubes of the collector. As the water rises through the collector it is heated by the sun's radiant energy. The swimming pool water is then returned to your pool to repeat the cycle until your pool is warm. 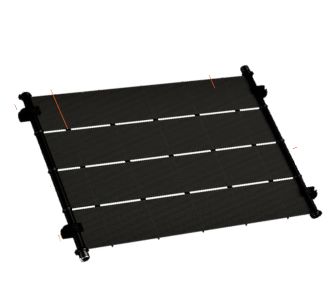 Helicols solar panels are a one-piece unibody construction, with panel clamps, Individual tubes with an open flow design increasing flow and reducing back pressure. Use in conjunction with your pool heater to extend and reduce pool heating costs. Heliocols patented over-molded header insures the strongest possible connection between tubing because the header is actually formed around the tubes. This process actually joins the tubes and header together as one solid piece. This is why Heliocol is the only product of its kind to meet "zero-defect" ISO 9002 specifications and standards. 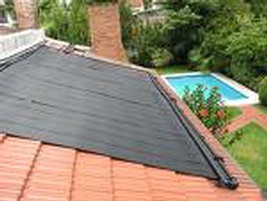 Heliocol Solar Panels from Wizard Pools carry the longest and most comprehensive solar panel warranty in the whole of the Canaries.